Stem Cells are simply “blank slate” cells. The body has yet to tell them what kind of cells they are to become. Embryonic Stem Cells come from eggs that have been fertilized in vitro and then donated for research. These are donated eggs, not eggs that have been fertilized in a women’s body. 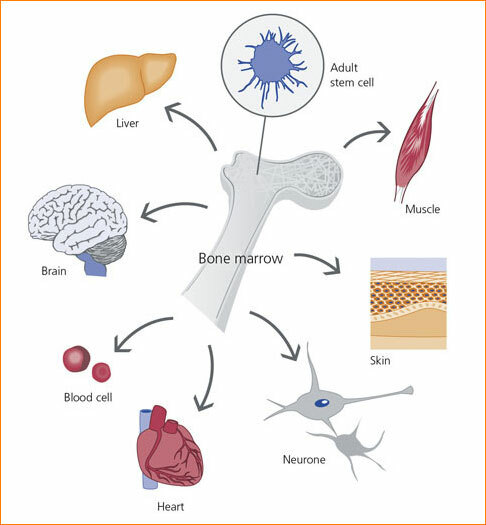 Adult Stem Cells come from Bone Marrow, Fat or Blood. Adults have a smaller number of stem cells than are found in an embryo, however. Our bodies utilize stem cells everyday for repair. Adult Stem Cells serve as our “maintenance department.” They work by regenerating cells that are damaged by disease, injury, or just every day wear and tear. These Adult Stem cells can be harvested, or extracted from the body, and used to help aid in tissue repair in other parts of the body. Bone marrow, which requires extraction by harvesting, that is, drilling into bone and drawing out the bone marrow. Blood, which requires extraction through pheresis, like when having your blood drawn, or donating blood. The blood is then passed through a machine that extracts the stem cells which can then be used for tissue repair. Stem cells can also be taken from umbilical cord blood just after birth. How are Stem Cells currently being used? Stimulate growth or normal tissue, as opposed to scar tissue. Scar tissue, which is characterized in the skin by disorganized collagen structure, loss of hair follicles and irregular vascular structure. In stem cell therapy, normal tissue formation is encouraged, rather than scar tissue formation. Stem Cell Therapy procedures are typically done in the Operating Room Suite.This technique involves injecting stem cells, with or without platelet-rich plasma, to treat the stressed or injured tissue. These shots can work better than the traditional cortisone shots, since they not only soothe the pain, they can regenerate damaged tissue in patients with chronic injuries or aid in surgical recovery. What can Stem Cell Therapy be used to treat for the Foot and Ankle? If you have one of these conditions and think Stem Cell Therapy might be right for you, contact one of the Foot and Ankle Specialists at Academy Foot and Ankle.